I have a passion for senior dogs and would love to see more finding homes, so of course I’d like to “convince” you to adopt one!! I used to volunteer at a shelter that had what they called “the oldies room.” It was a lovely set up where all the old dogs lived cage free. They had beds, toys and lots of attention from volunteers who had a soft spot for them…myself included. Being right near the reception desk potential adopters would peek in to see who was there. When they heard the world “old” many would bolt, some wouldn’t even bother going to look, while others would gush over them, then ask where the puppies were. Once in a long while a kind soul would come by and offer one a home. Of course anyone that rescues, no matter how old or young the animal, is a star in my book, but there’s an extra big and shiny star for someone who gives an old dog a home. That wasn’t the only scenario that made me sad. I can’t recall the number of times I saw quite elderly people with serious mobility issues come to adopt. When they looked into the oldies room they would comment the dogs were too old then ask where the younger ones were. Yes anyone is entitled to adopt any aged dog they want, but why would they want one whose needs they cannot satisfy, and overlook an older less active dog that may still need walks, but whose needs they could satisfy? What was particularly upsetting was the attitude of the front desk staff. When people would come in and ask where the dogs were they would point them in the direction of the puppy room and kennels with the other dogs. Then with a very cavalier attitude they would say “and those are the old dogs.” They made no effort to explain there were plenty with lots of energy who could happily go hiking, or talk about the benefits of one that appreciated a more relaxed pace of life. They just dismissed them as not being worthy. Yes this is a topic that has me hopping on my soapbox with no desire to get off, but I will…soon! Personally I think old dogs are gorgeous, but I understand why people see puppies as too cute for words and want one NOW! The thing is many are treated as impulse buys, and unlike a sweater than can be easily returned with no harm done, the same cannot be said for a living being. Raising a well behaved and happy puppy is a lot of work. They don’t train themselves and a lot of time and effort must go into their training. If there is no one home during the day what will you do with the puppy? You cannot keep him in a crate 10-12 hours a day although many people do, but it’s not fair. Will you hire a dog walker? Enroll him in doggy daycare? Do you have an active social life in addition to your work life? How does a puppy fit into you going from work to drinks and dinner with friends? What about those spontaneous outings you like to take? When it’s impossible to resist the adorable face without giving it the serious thought it deserves, nobody wins. Returning the dog means heartbreak for the people involved, especially the children, and the longer you waited to give him back, especially without training him, the more unadoptable he becomes. This and similar scenarios do not lead to a very happy ending for the pup. I can’t say I ever intentionally set off to rescue senior dogs, it is something that happened while I was volunteering. To make a long story short, I spent a few months working in the shelter I mentioned and I would sit outside eating lunch and reading a book. After a couple of days I realised what a waste of time that was when I could be hanging out with the old dogs. So every day I took one with me for a little walk and a cuddle, and it didn’t take long for me to be hooked! The cutie in the stroller is the love of my life Red. Sadly she gained her wings on May 18, 2018 and I miss her every day. She found me first then I fell for her and she became mine. She was blind, obese and around 8 years old at the time, and we shared our lives together for 9 years. Although I have another rescue named Jack, there is still a hole in my soul where an old dog should be. I will be rectifying that!! Now my only requirement for adoption is the older the better. Why? My soul is nourished by being the guardian of dogs in their golden years and it is as simple as that. Let me clarify – Jack is the first non senior we have ever adopted and I will tell you why I agreed to break my rule. My husband really wanted a pal who would stick around, because one dog we only had for 2 days before he died, another 3 months, and his favourite just 2 years. Alright enough about me. Let’s talk a little about why animals of any age end up in shelters. Humans surrender (usually dump) animals for a variety of reasons, some valid, most not, but all heartbreaking. Any behaviour issues are a direct result of no/inadequate training, socialisation, enrichment or thought to what is involved in their care. Of course a few of these reasons are legitimate and I can’t help but feel sadness for anyone forced to part with a much loved companion. The rest are cop outs. I may sound harsh but that’s the way it is. Pets are seen by many as disposable, when they’ve had enough they return them, much like a sweater they don’t care for anymore. It is an attitude that needs to change, and the sooner people realise animals are sentient beings, the better for all of us. I volunteered for a long time at a local shelter and heard the excuses. I will never forget watching a woman casually dump her cat because of “allergies” then play with others in the cages. Hey lady, didn’t you say you had severe allergies! She probably got more emotional returning a pair of shoes. It’s good for your soul and good for theirs. What could be better than giving an old dog a home in his final years, months or even weeks. For me no other reason is needed. There is something about the images words like “old” or “senior” bring to many a mind. Shriveled up, dried up, shuffling along, sleeping all day, barely moving, not even worthy of attention. You and I may not see that, but sadly many do. Look at the way much of our society views elderly people? It stands to reason some of that attitude will extend to animals. I was at the beach recently and watched a beautiful 9 year old Staffy run like a lunatic, chasing a stick and having the time of her life. Because of her age she was “classed” as a senior, but there was nothing remotely old about that girl. I have literally lost count of the number of times I’ve heard people tell me their dog is much bigger than they expected or wanted, they’re too energetic… When you adopt mature animals there are no mysteries about what their adult size, personality, energy level, or grooming needs will be. 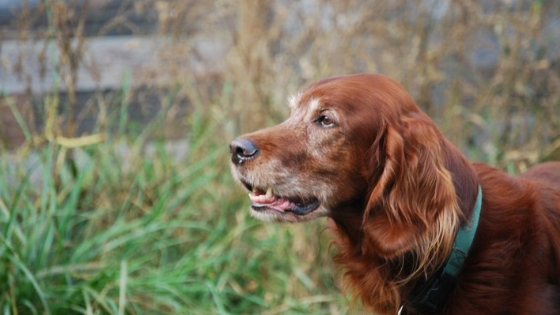 A senior dog will likely have some training, and that includes house training. He may have forgotten some of it due to circumstances, but a few days in a home with a schedule and structure, and he’ll remember everything he knew. Look at it like this…the chance to do a bit of training will be a great bonding opportunity while providing mental stimulation at the same time. Believe me, old dogs can absolutely learn new tricks. A senior is well past the destructive chewing phase, so your favourite chair legs or pair of shoes should remain intact. You read it right! What, you thought all old dogs just want to sleep all day? Okay some do, but old is just a number, and plenty of dogs classed as “senior” simply because of the date on the calendar, have more energy than a lot of us! Remember what I just said about the Staffy on the beach? If you’re ready for a hike, a canoe ride or some other adventure, you can find a seasoned companion to be right by your side. On the flip side, if the closest you want to come to a hiking trail is seeing a picture of it, there are plenty of senior dogs who feel the same way. Mature animals often have an easier time fitting into a home that includes other animals, because they learn and respect boundaries more quickly and are eager to bond with their new families. I must add this brief thought – it’s natural for any rescued animal to need some time to adjust, so please give them that time. Older dogs generally have some kind of training, they just might need a refresher if they haven’t lived in a home for awhile. It’s unlikely they have severe behaviour problems as most shelters would have killed them quite quickly. Harsh but true. 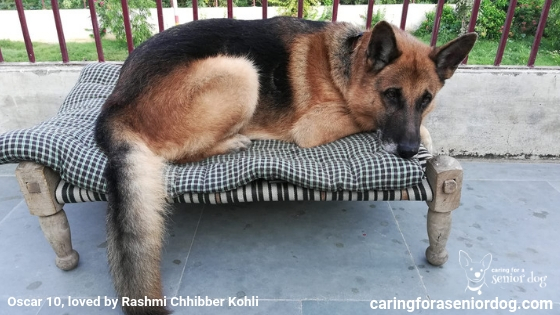 Adopting from a foster based rescue means their dogs are living in homes, training and behaviour issues are being addressed, and you’ll know their likes, dislikes, and anything they may need brushing up on. Unlike the puppy that has to go out during the night for pee breaks and cries because he misses his litter mates, your old dog will get himself settled into his new bed and sleep. Depending on a senior dog’s background, he may have a few scars from a bit of a tough past but they don’t tend to wallow in it. They live in the moment and will spend each of those moments loving you. You really want a dog but aren’t sure you are able to devote the next (potentially) 10+ years to one. Adopting an older dog could be the answer. The boisterous and wild times of their youth are mostly behind them (some of course are still as rowdy as ever!! ), so the calmer senior dogs make excellent therapy dogs. A few of the oldies at the shelter I mentioned above were regularly taken to visit seniors in nursing homes. The dogs loved getting out and about, and needless to say the residents were overjoyed at the chance to spend some quality time with a fur baby. Older dogs are often overlooked in shelters and believe me, it’s sad to watch. With puppies and kittens killed every day in shelters across the country, what chance do you think an older dog has of making it out alive? How wonderful to have the opportunity to literally save a life. 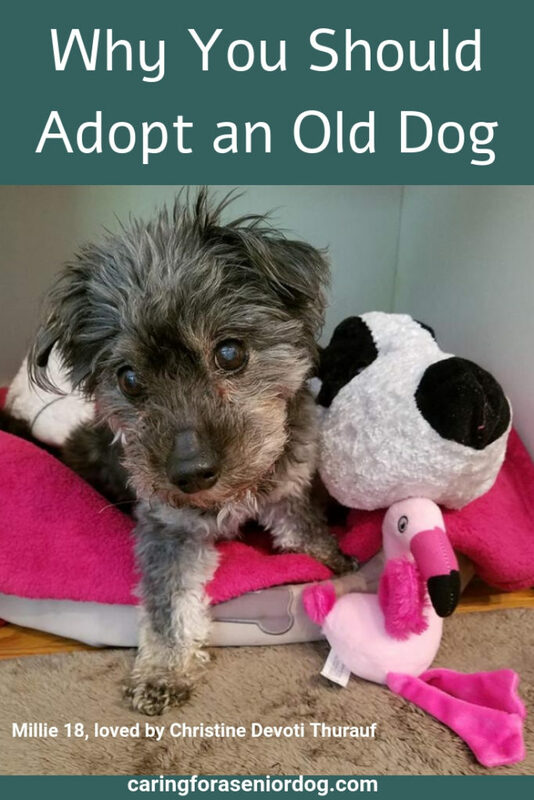 I do hate to sound like a cliche but….I don’t want you to dismiss adopting an older dog because you believe they cannot be trained or learn anything new. They absolutely can! Adopting an old dog shows and teaches compassion, and that life has value no matter the age. What an incredible lesson for children to learn. In my experience they know when they’re being given a chance at happiness, and they’re grateful for it. Many shelters offer a “senior for senior” program where they encourage the adoption of senior dogs by senior humans. A win-win for everyone I’d say! I may be a cheerleader for senior dog adoption, but I know there are concerns. Your dog may have a few housetraining issues at the beginning. That doesn’t mean he wasn’t trained, it just might mean the shelter was short on volunteers so he had to pee and poop in his kennel. The day I brought Red home, she peed in her brand new bed. How was she supposed to know she was going to be taken out often enough? It didn’t take her long to figure that out though! Surely they’ll have health problems! Old does not mean sick, old means they’ve reached the number that says “senior.” Many old dogs are in great health, and many young dogs are not. It’s true the older we all get the greater the chance of developing health issues. Red had her share, and our younger dog Jack became paralysed at around 4ish (don’t know his exact age) and had to have very expensive spinal surgery. I am not in a position to comment on anyone’s financial situation, so whether or not you can afford vet bills is for you to decide. I can say as a general observation the average person will find money for what matters, but even that might not be enough funds in some cases. Health insurance for a senior dog may not be an option due to monthly cost or lack of sufficient coverage, so here is an idea that may help. Choose a denomination of coin or bill, and at the end of each day take all of them out of your pocket or wallet and put them in a jar to be used strictly for vet bills. You’d be surprised how quickly it adds up. Buying medications from your vet’s office can be significantly more expensive than buying online. One of Red’s medication was $108.00 at the vet, but only $34.00 online. That is a massive savings for me. Taking good care of our dogs from the day we bring them home can significantly reduce health issues later in life. Yes that still applies to old dogs. You’d be surprised how much a good quality diet, exercise, mental stimulation, supplements and a loving home can contribute to their health and well being. If you can’t adopt can you foster? If taking on the responsibility of a dog full time is not something you can do at the moment, or you can’t afford to shoulder all the potential expenses, would you consider fostering? Shelters and rescue groups are in desperate need of foster homes, and you can choose the length of time you’re available, even becoming a permanent foster carer. What’s great is how many shelters and groups help with the bills. This article on Why You Should Foster an Old Dog has all the information you need. I guess you can see how much I love old dogs, and why I encourage everyone to consider welcoming one into their home. 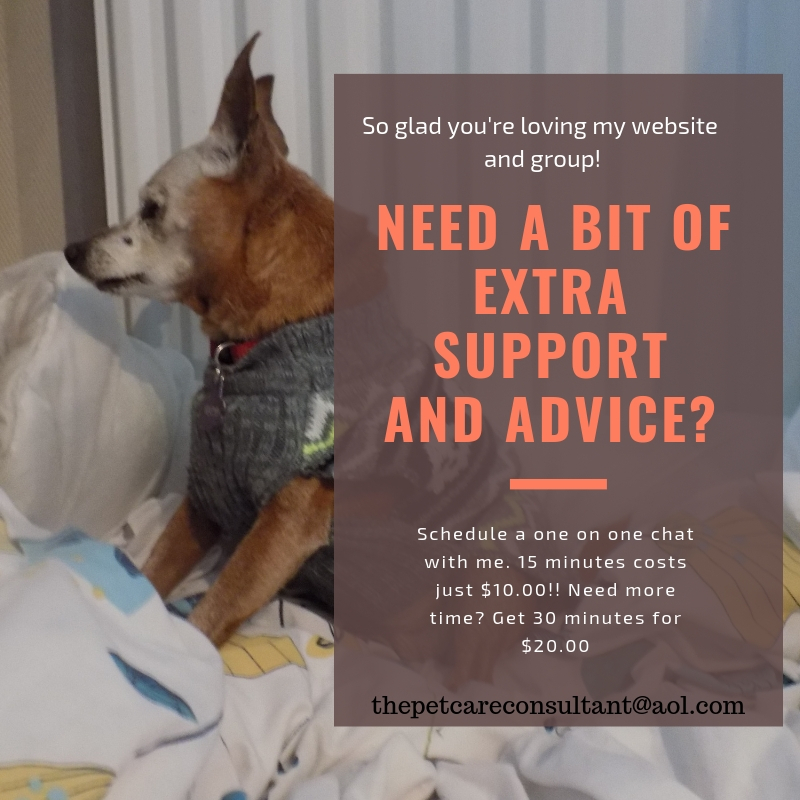 If it’s not for you, and I understand it may not be, what about supporting a senior dog rescue group? They could always use financial donations or supplies to help them with the lifelong care of their residents. Have you adopted a senior dog? What made you consider an older dog? Why not share your story in the comment section below and help others see the benefits and joy. All of these pups are so delightfully beautiful! We love senior adoptions and have had quite a few ourselves. We’ve learned a few things from seniors: they are always so happy to be loved (again), love easily comes to seniors and they will show you this in spades, already trained or easily trained, and easily get into your rhythm of the day. Nutrition is often key with seniors – we’ve helped get many off of medications just through good, quality nutrition (and lots of love)! Great post – we love it! Thanks Rebecca. I love hearing you’ve adopted seniors, how wonderful! I also found they fit right into the schedule I had in place. It’s amazing how proper nutrition can even reduce or get rid of the need for medication. That’s really something. Is there a specific food you tend to feed them? Old is not dead, that just brakes my heart. Seniors have so much to give. They are wise, dedicated and so sweet. Thanks for this post. It is heartbreaking. I’ve been seeing these amazingly energetic senior dogs at the beach recently, yet the word “senior” evokes images of constantly sleeping, can’t move well and old. While energy levels vary, each one is deserving of a home. No greater feeling is enough for me as well, sadly most of the population needs some convincing or should I say re-programming. There certainly is something extra special about seniors. 🙂 I love mine. Agreed, let’s hope more people get the message. I agree with this article so much! And the only REAL excuse in my book is if an elderly person dies and leaves behind a pet and the person literally has NO family to care for it BUT I would rather a dog be adopted by a LOVING home than taken in by a family member who won’t properly care for it. So sad and yes there is potentially more of an expense but I always tell my friends and family never to take on a pet if they can’t afford emergency care, or be willing to sacrifice their own needs for that of their pet. Which we have had to do. Such a great article and I agree older pets are so loving, devoted, and wonderful. Hi Joely, I agree with you about what qualifies as a real excuse, and you’re right to express the importance of being able to afford emergencies for pets of any age. There are plenty of older dogs that aren’t wracking up medical expenses, and young ones that are. Our 4ish year old dog just cost us several thousands due to spinal surgery. Not something you would expect. Very true! Our Lyla has always had health concerns since she was little. Just like with people – when it comes to health age does not always matter. Well said Joely, if only more people saw it that way. All pets deserve a loving, caring home but adopting or fostering an older pet can mean so much to all involved. Just because a dog is older, does not mean it has less love to give. I couldn’t agree more Kelly! I love older dogs and think it’s a huge shame they are often overlooked at rescues or shelters in favour of a puppy. They have nothing to offer you but unconditional love. Great post highlighting this. It’s so tragic we have this attitude of something old being disposable and not worth much. Sadly that extends to animals and people. We just have to keep trying to change that. I think senior dogs are a great option for many people as long as they can handle the vet bills. The thing is, just because a dog is older does not mean vet bills will be high. Plenty of senior dogs are in great health, while being young is no guarantee they won’t cost a lot. We have a dog that’s around 4 (my first ever young dog), and he became paralysed in a matter of a few hours in August. After an MRI and spinal surgery our bill was about $6,000. No senior dog ever cost us that much. I took my dog when he was about 7 or 8 – I didn’t think about him being an ‘old dog’ That was four and a half years ago and he still runs like mad. Had him out walking today – yes, off leash, along a trail and people who passed me said, “hey, you have to walk faster.” “No,” I said, ‘I have to run.” – which is what I usually do. Thanks for your comment Sherri. I love that you took an older dog, too many people pass them by in favour of puppies. So great to hear he’s running around loving life. All the dogs you featured are just the cutest things! My husband and I want to start adopting older dogs once we have more space and money to care for them. More importantly I want to dedicate a portion of my shelter’s opperations to hospice care. You a wonderful person to give these dogs such loving last years. Hi Amber, Your goal of opening a shelter is amazing, and I love you’ll be dedicating a part to hospice care. My dream is to have a retirement home for animals, including hospice care. Good luck I’m sure your dream will become a reality. If you’re looking to hire staff one day…. Had to stop part way through reading this post to go hug on my 13.5 year old girl, Zora. 😉 In her older years, Zora has cost me much less than my younger two. She has reached this special place of calm and I can’t imagine not having her elder energy to balance the crew. Oh no! It is nice to have some calm energy around, can’t have non stop activity all the time. Hi Ruth, it makes me feel so good every time I hear the “rescued.” I hope you have many long, happy and healthy years together. This is a great post! The last dog we adopted was an adult and he has been much easier than puppies! I will consider adopting a senior dog in the future. My Maltese is considered a senior (she’s only 9) but she is not anything close to being an old dog. However, old dogs are some of the sweetest dogs I’ve ever known and they bring a lot of joy to anyone who gets to spend time with them. Thank you Beth. The problem is the images many people form in their heads when they hear the word “senior” and that applies to people as well. It’s purely a random number that was chosen to depict something of a certain age, but has no bearing, or should have no bearing on one’s ability to live, give and receive love. That is so true, age is just a number! When we adopted Theo he was 4-5 and his transition was so easy for us, that I doubt I’ll ever have a puppy again. The next time we adopt, I’ll definitely consider a senior dog. Glad to hear you’re considering adopting a senior dog when you’re ready to welcome a new furry family member. Just the thought of having a puppy is exhausting to me. I’ve never had one, and I just couldn’t handle it. They’re beyond adorable but I know what I’m willing and not willing to put up with!! Can’t do better than a sweet old dog. Wonderful post, Hindy! I totally think senior dogs ROCK!! Both my dogs are 7+ yrs old & have always been super healthy, amazing dogs! I love them both SO much. Bless you for rescuing senior dogs. Thanks Cathy. To many more years of health and happiness with your dogs! I hope I’m never in the situation where I need to surrender my girls. It would kill me! I couldn’t even imagine. Start making lots of good friends now!! Senior dogs can certainly be a good option. I just wish dogs lived longer as their time with us is already too short. I agree with you there – way too short. 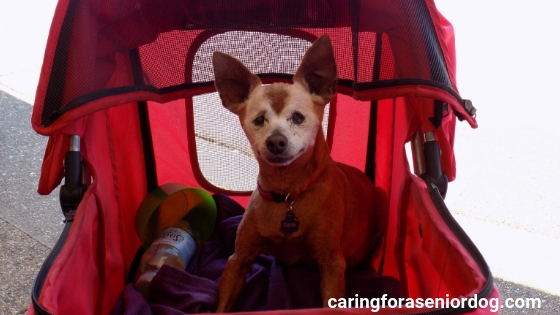 Well Malaika, sure sounds like you’re the perfect ambassador for senior dog rescue! This made me tear up! Almost a year ago, I was looking for a dog. I didn’t know what kind I wanted. I am a 24 year old single female and I wanted a best friend. I knew I wanted to rescue a dog. So I liked all the rescue pages on Facebook near me. It was December 8th, one of the rescues posted this sweet video of this dog in a Santa hat and a jean jacket with lights all around him. One of the voulenterrs was a singer and was laying down beside him and made up this cute song about why you should adopt him. It was this cute little old 9 year old Pekingese with his 2 bottom teeth sticking out. I knew right then and there, I wanted him. I raced to the shelter the next day at open in hopes he was still there… he sure was! His owner that had him his entire life had passed away. I scooped him up right then and there. And man, I couldn’t ask for a better dog. He hates being outside, is super lazy, house trained and the BEST cuddle bug I could ever ask for. I had stupid people ask me “why would you adopt a old dog, he’s going to die soon anyways”. Stupid. I knew I would give him a good rest of his days, years, whatever it maybe. I will always adopt seniors from here on out. Seniors are the best! What a beautiful story, and so wonderful you found each other. I hate stupid people as well, how heartless and cruel. Next time someone said that to me I would say I hope whoever cares for them in their old age doesn’t have the same attitude. Seniors are absolutely the best, and they’re great for the soul! Getting a puppy has certainly made me re-evaluate my next choice when it’s time to add another dog to the family. When I adopted Gretel, she was almost 1 (not senior, I know, but not puppy either). She was so anxious she was on Prozac. To be honest, it was less work to integrate her into our family, and turn her into a well-adjusted dog, than it has been caring for a puppy for almost 3 months. Yikes! Luckily, I work from home so I can attend to her needs but I can’t imagine what it would be like if I worked full time out of the house. Your puppy is so adorable!! I give you all credit for having the strength and patience to raise a puppy, because I know that’s something I would never want to do. Give me the old ones any day!! I’m all for adopting senior pets. (And that photo of Millie just melts my heart.) Before I adopted Lola I wanted to adopt an older cat, but fate brought us together when she was seven months old. You found the cat you were meant to find, and look how much she has inspired! Gosh, now I want to run to the shelter and adopt a senior dog! I do love my senior dog, though. We’ve spent over a decade together and I’m hoping for many more years. I can’t imagine adopting any other age!! I hope you have many more years to share together as well. I hope it inspires them as well! I can’t believe the number of very elderly people I’ve been meeting lately who adopted a young high energy dog, and the dogs are paying the high price for that ignorance and insensitivity. Agree with you 100%. We have had many seniors cats and dogs. They have taught me so many things, but mostly to value quality over quantity. It’s not how much time you have that matters but what you do with that time that matters. I can’t believe the front desk staff at the shelter you mentioned didn’t even encourage adopters to look in the senior dog room. They are the very ones who should know better. Couldn’t agree with you more. Knowing I gave a dog a home at the end of his or her life, even if it is for such a short time means the world to me…and them. It was heartbreaking to see that from the staff, and shocking considering how much the director was responsible for rescuing those older dogs from kill shelters. Wow, you covered everything! 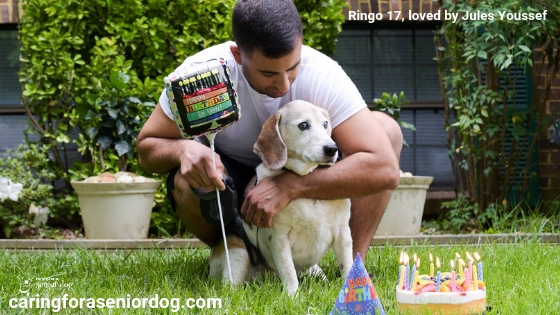 Great post in time for National Adopt a Senior Dog Month! Thanks Amy! I hope this month dedicated to senior pets will get more people thinking. I think senior is a stigma as there are so many out there full of life and needing homes and love. There is an amazing Rescue Organization in San Francisco that only rescues seniors and her adoption rate is amazing which only shows how many people do do it. I agree, just hearing the word “senior” whether it’s human or animal brings to mind so very negative images. Once we stop seeing senior in that light things will be better for everyone. Awesome post! I’ve always been a “puppy person” and love love love puppies, but now that my oldest boy will be 10 soon I’m really learning first hand how amazing older dogs can be. My boy is still active and fit, but unlike his younger “brother” he has an off button and is calm around the house. He has 10 years of experiences and training under his belt and is such a good boy. I can see the appeal of adopting an older dog for sure! Plus they are just too adorable. Something about those greying muzzles really gets to me. Thank you Michelle. I’ve actually never had a puppy and never will, I just don’t have the patience. I think people hear the terms “old” or “senior” and think decrepit, lying on a bed all day doing nothing when in fact the opposite is often true. The grey gets to me as well. I’m a dog trainer and I had a client today who had a 14 week old puppy and a 15 year old dog. While the puppy was beyond adorable and that’s who I was there to advise about, I must admit it was the old one who had my heart. I work at a shelter and so appreciate your plug for adopting senior dogs. It’s very sad when some of these sweeties come in – their world is turned upside down. A big bonus is that many of them don’t have any vices, compared to younger pooches. It makes me incredibly sad, and very sick watching people walk out with puppies. At least they’re adopting, but these poor old dogs and cats dumped and have no idea what’s going on. Sadly it’s often because they were replaced with a younger model. Just adding an updated note in support here. Great post- Kilo the Pug apparently belonged to an elderly couple when he was a puppy (probably from a puppy mill). They only kept him 6 months as he was way too much trouble. He looked super cute and they thought pugs were low maintenance. Perfect example of where an older trained pug would have probably been perfect but an untrained, demanding, nipping, unsocialized, spoilt, shedding, zooming pee and poop bandit new puppy was not. Sadly for him, they gave him to a teenager and by the time we got him at 2 he had been through 4 homes and had severe issues. Arggh. People should get the age and breed that suits their time, energy, budget and lifestyle. I think fostering or volunteering can be a great way to test the waters and recommend it to lots of people thinking of getting a puppy. Great comment and I couldn’t agree more. I’m constantly shocked by the number of people who give no thought to getting a dog let alone the type and energy level. The only ones that suffer are the poor dogs who end up in shelters due to “behaviour” issues and too many don’t make it out alive. Fostering is a great way to test the waters and see if a dog is really the right choice. In my role as a trainer I met a family who are fostering for that reason. Personally I don’t think they’ll be able to cope with a dog so will not keep her, but at least it’s just a foster situation if it doesn’t work out. I love your passion Hindy! I share that passion. It was heartbreaking to see so many older dogs passed over for puppies at the shelter I volunteered at. People don’t always remember that the adorable puppy stage is fleeting, only a few months and that puppies can be a ton of work. Icy and Phoebe are both 9 now, but you’d never know it! They both still have so much energy and love to be active. Older dogs can be a blessing and a joy, don’t pass them up! I experienced that same heartbreak Cathy. The worst was seeing quite elderly people say the old dogs were too old then got a puppy. I currently volunteer to walk a dog for this older couple who have a young chocolate lab!! They are such lovely people but what possessed them to buy a young dog like that, and not train her to walk on a leash drives me mad. At least they’re making sure she gets out but it’s certainly not enough to satisfy her needs. Always so sad. Glad Icy and Phoebe are still active and loving life…9 is the new 3!! As we are getting older, we are also choosing older dogs to adopt. One of our major constraints is medical history, though. We cannot afford a dog with any health issues that would be excluded from insurance coverage. I know what you mean, it’s tough to know a dog’s medical history if he’s a rescue, especially an older one when “owners” often lie. I’ve never had pet insurance and I know what a financial burden it can be. What a wonderful post. I agree 100% with everything you said. I’ve never owned a dog however I have owned two cats until the end of their lives and I’m now a new foster mom to a fully grown adult cat almost in his senior years. It’s the best decision I’ve ever made for all the reasons you stated above. It breaks my heart to know that so many pet parents dispose of their pets just because of their age. They really don’t understand the full commitment it means to be a pet parent. When you adopt people need to realize that it is for the entire span of their lives and not when it’s just convenient. Thanks for sharing your wonderful post. I’ll have to share. You’re so great for fostering a cat and giving him the chance to live in a loving home. I wish more people would think to foster, especially if they aren’t sure they’re able to commit to many years of lifelong care. Couldn’t agree with you more – it is a commitment until the last day of their life, not until you don’t feel like doing it anymore. Excellent post, Hindy. I just Pinned to my Bark About board to share. Having four seniors, I cannot imagine anyone leaving their babies in their golden years after so many years of love and devotion. I know sometimes situations arise where they lose their humans, and I think advocating for adopting senior dogs is so important so they can live the rest of their life happy, secure, and well loved. I can’t imagine what drives people to dump their animals, not matter what age they are. It’s true there are, sadly, many situations where there doesn’t seem to be a choice, and that makes it even more important for people to consider adoption rather than buying animals and encouraging irresponsible breeding. Yikes I was just about to fully step onto my soapbox! !